As an investor, we should always aim to protect our capital. Before we follow SPs (Strategy Providers), we would usually look through their trading statistics and make informed decisions based on our risk tolerance. However, there is only so much an investor can do to ensure that the risk they take is minimised. Which is why we have to set a safety net to prevent the strategy provider from making risky trades or “revenge” trades when they lose. Under the settings section when you add a strategy provider to your portfolio, scroll down to advanced setting. Input the maximum lot size that is within your risk tolerance. A general rule of thumb is to set Lot Max to 3-5% of your maximum risk per trade. For example, you have a 10k USD account and the maximum pips you can lose is 100 pips. This will mean that the maximum lot size will be 0.50 for a 5% risk per trade. This is the amount of pips you are willing to lose. With this number, you can calculate the maximum lot size you can trade that is equal to the risk you want to take. Forced Exit & Stop is a good way to prevent you from losing your whole capital. For example, you want to stop your account once you lose 50% of your balance, and with a balance of 10k USD, you just have to set 5k USD as the amount in the parameters. 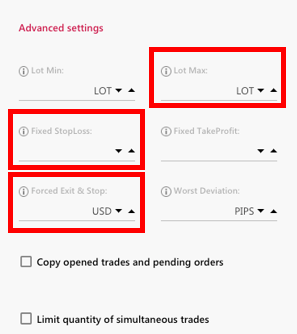 However, we must take into consideration that these features that you set may disrupt the original trading strategy and you may receive different results from the provider.